We have finalized the Food Trucks for our Back to School celebration . Please help our little school raise funds while enjoying unique and delicious food. All trucks will take Cash and Credit Cards. Hope to see you there. Today we kick off our PTA Check Writing Campaign in support of Art and Technology programs at Los Cerritos. Art masters and educational technology programs like Newsela don’t happen at Los Cerritos without your support. What is Newsela? You can find the PTA letter to the right in the fundraising locker. Just click and download. Every Friday after school at the Marquee and Wednesdays at lunch. $2. Sales benefit the outdoor science lessons in the garden. Los Cerritos Banner Program- Support our School and brand your business, company, or organization at the same time! Promotes any specific religious belief or religious institution. We appreciate your support of our Los Cerritos Roadrunners, and look forward to supporting your business! Thank you for supporting our Los Cerritos Roadrunners, and providing an opportunity to allow ours students the benefit of expanded programming. Please contact Allison Kripp at (310) 488-5154, or via email at Allison@densalonlb.com for further details. To complete the form, see our PTA Fundraising Locker to the right. For those of you who shop at Ralphs and Food 4 Less please take a moment and register your rewards cards and you can immediately start giving to our school. Yes, that's right - we are getting paid to do our regular grocery shopping. Sign up at Ralphs & Food 4 Less. Do you already shop on Amazon? Would you consider starting at smile.amazon.com to make the same purchase? Same products, same shipping, but every purchase gives back to your favorite non-profit. 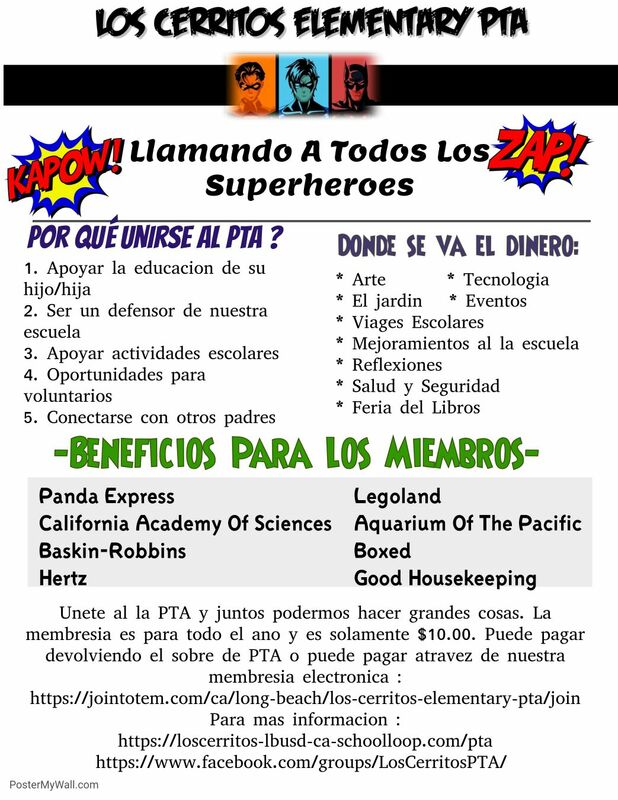 If you're interested, please link your account to Los Cerritos PTA. Did you know, since Los Cerritos PTA has been participating in the Box Tops for Education Fundraiser, the school has, through the years, raised almost $10,000! Every little box top really does count! Don't forget to keep clipping and saving. Look for a Box Top sheet to come home soon and turn those little money makers in.